I haven't given much thought to rye. As a cereal grain, I suppose I like it well enough, but I'm fairly certain this was my first time baking it into a loaf - and it was a naturally leavened loaf at that. The only rye product I had in the house to turn into rye flour for this recently baked experiment was rolled rye flakes I had gotten some time ago at my co-op, and I'm not sure if my finished bread was a direct result of less than optimum rye flour or not. 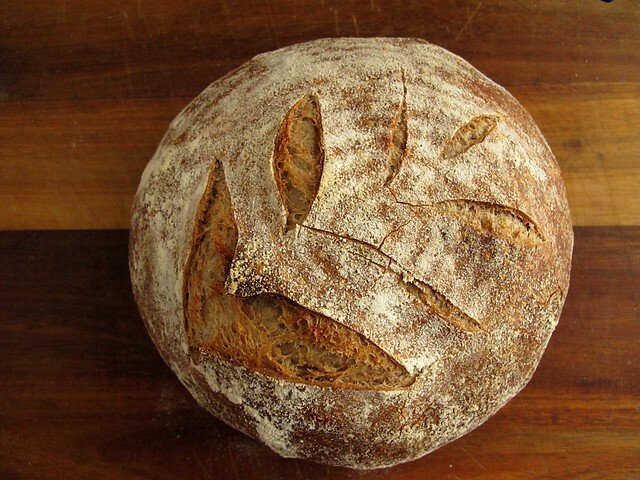 Either way, this bread was most delicious, and it piques my interest to work with this grain a bit more. 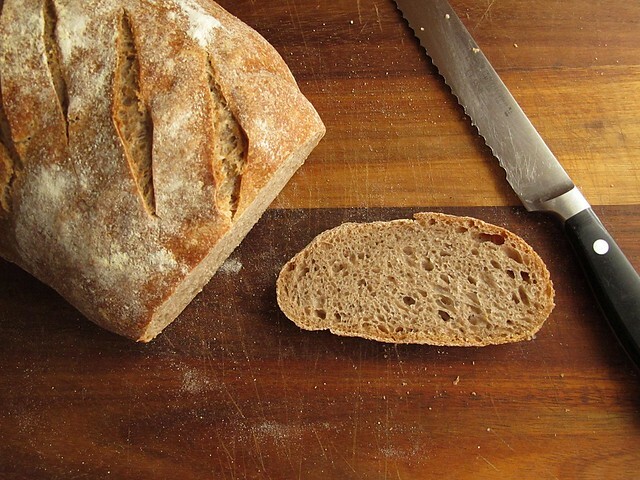 This is just an account of my first rye bread, baked with instruction from Peter Reinhart (who I'm sure will appreciate that I'm not writing down every one of his recipes from Crust and Crumb into my blog). I did follow his ratios, and I built a rye starter in a single afternoon from my standard resident starter. This added a day to the bread with an overnight rest in the fridge, but it was all just in wait time, not really active work time. On his recommendation, I also added a tablespoon of cocoa powder and two teaspoons of instant espresso powder hoping for a deeper external coloring. An exceptional tongue may be able to detect it, but I can't say I could. Pliny the Elder, the ancient Roman philosopher and naturalist who had a penchant for cookery, said that rye is "a very poor food and only serves to avert starvation" and spelt is mixed into it "to mitigate its bitter taste, and even then is most unpleasant to the stomach." The three day building of this rye bread most definitely served to break down those parts of the rye plant destined to be indigestible. And the greater wheat flour content tempers any would-be-overwhelming bitterness as well. The French term this type of rye bread with more wheat than rye "pain au méteil", and the instruction in Peter Reinhart's Crust and Crumb called to bake it deep as possible without burning... but I couldn't bring myself to go much darker than this. 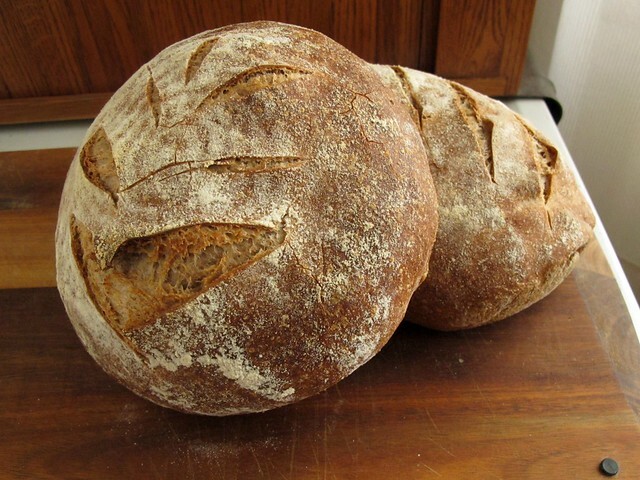 I am going to go on a rye mission, grinding coarse rye flour from rye berries and not rolled flakes of rye - and I'll bake the pain au seigle as well, which is the version that contains more rye than wheat. 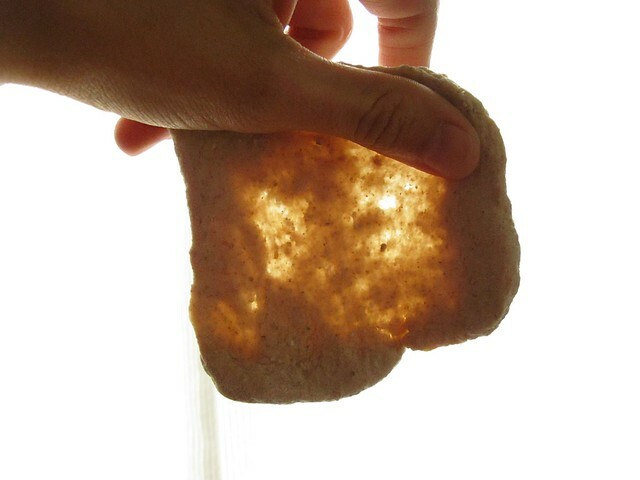 I'm also going to try to bake on a stone, and burnish the crusts out with longer baking times. Rye flour contains far less gluten than wheat, but yet the dough seemed to reach the "windowpaning stage" faster than traditional, all-wheat breads I've made. From the photo, you can see that the gluten hasn't quite developed at this stage. Two minutes later, it stretched thin and without breaking into holes. It was a lovely dough, and it felt good to have a traditionally kneaded dough in my kitchen after so many months of merely "folding" high-hydration doughs. 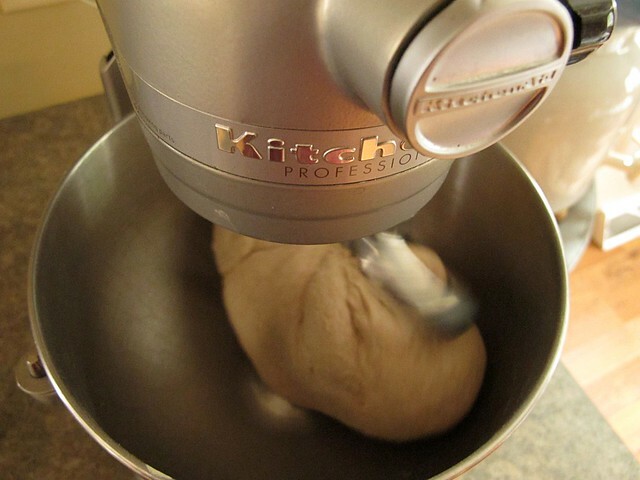 Even though (with kneaded doughs) I let my mixer do the bulk of the work to save my hands where I can, I never resist the pleasure of a minute or two of quality "counter time" with a dough! I formed the dough into two loaves: one round and one oblong. I have a proper brotform for the round loaf, but improvised another small basket for use as an oval support. The breads rose much more than I anticipated after they were formed, risen, and then retarded overnight. The round loaf must have been better formed, since it didn't appear overproofed when I scored it. The oblong loaf deflated and had an almost tough "skin" that made pretty patterns impossible. I used Chad Robertson's 50-50 mix of rice and wheat flours to dust the bread cloths thoroughly, though I might not have needed a cloth at all in my brotform that is well-seasoned. I brought them out of the fridge, and let them sit at room temp for about a half hour as the oven heated. Unlike Reinhart, I baked them both in covered iron pots - the oblong one just barely squeaking in, thus its rather homely looking appearance. I heated them to 500, then dropped the heat to 450 just after popping them in. I uncovered them after 15 minutes, and baked about 20 minutes longer. But like their related Human Beings, no matter what they looked like, it was what was inside that mattered. Gentle, small holes, with a slightly more regular pattern than the breads I've been used making lately. The crust was thin, brittle, and easy to chew; the texture of a slice had enough resistance to be interesting without being boring. I ate the heel, plain without adornment, amazed that wild yeast produces such amazements with such a little help from me. Returning to a well-loved bread book after so many months away felt unnaturally calming. I remembered immediately why it is one of my favorites, and one that produces excellent results, even if my results are most definitely different than those described in black and white. I ate this bread for lunch today, it's second day, sliced very thin and toasted, topped with super ripe avocado, fresh sliced San Marzano tomatoes, coarse salt and pepper and some arbequina olive oil I decided I had to try (and it was so good I'm glad I did). I actually can't wait to taste this bread as it ages a few more days, I have a feeling that the flavor will only continue to develop.